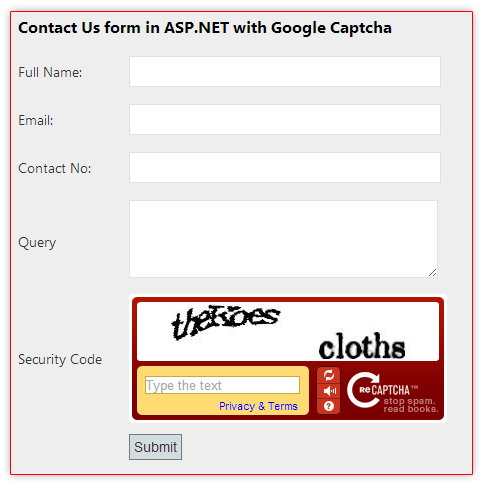 In this post, I am explain how to use google recaptcha in asp.net. Google reCAPTCHA is a free service from Google that helps protect websites from spam and abuse that restricts the automated input sent by a system and allows only input from a real human. We can create a CAPTCHA in many ways but Google provides a free reCAPTCHA with better security without any cost. Step-2: Sign up & Generate Key for Google reCaptcha. Go to http://www.google.com/recaptcha > Sign up for Google reCaptcha > Create Key(for Google reCaptcha). Step-4: Create table for Save Data. Step-6: Add a Webpage and Design for use Google Captcha. Step-7: Write this into Button Click event for validate captcha & Save data to database.